If you were walking out into the darkness of a shopping mall parking lot late in the evening and could choose one person to be by your side for protection, having Gheorghe Buruian of Morton Grove along for the trip would be a solid choice! Better-known as Master George, he is and Olympic Coach, military elite special forces, an instructor of martial arts, former MMA fighter, and now a Hall-of-Famer, when Buruian recently received a rare honor for even the most celebrated martial arts instructors -- being inducted into the Masters Hall of Fame at a ceremony in southern California. It's a crowning achievement in a career that stretches from Olympic stardom in Romania to coaching others in the disciplines of Krav Maga here in the United States at the White Tiger Martial Arts Center in Wheeling. 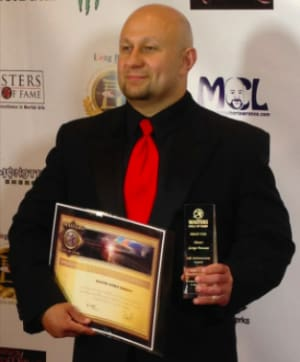 "It's truly an honor to join the likes of other tremendous martial artists as a member of the Masters Hall of Fame," said Buruian, originally from Romania and now living in north suburban Morton Grove. He mentioned that he always enjoyed teaching and showing others the techniques for not only competitions, but for potentially saving one's life through self-defense. Buruian indicated that it is the real life applications that he truly enjoys teaching and helping others so they have the ability to protect themselves. "Master George always strives to be great at everything he does," commented Head Maser Shik Lee, owner of the White Tiger Martial Arts Center. "The Masters Hall of Fame is a highly prestigious achievement and I am happy they recognized him for all that he has done to contribute to the growth of other athletes and the sport itself. I'm honored to work with such an amazing leader." The 42-year-old martial arts master currently holds a Krav Maga Expert Level 9 certification as an instructor -- one of the highest ranked masters in the mid-west. One of the aspects that gains him so much respect from others is that he not only talks-the talk, but walks-the-walk as a 3 degree black belt in Krav Maga and a 5th Dan (degree) black belt in Taekwondo. Buruian's first experience in training as a fighter was at the tender age of only 6-years-old. As the son of a boxing coach, he began as a student of the ring under his father -- traveling down a career path that would transition toward martial arts. He eventually earned a spot on the Romanian national taekwondo team and became the Head Coach of the country's Olympic Team from 1997 -- 2000. During this time, he coached others to the point of Olympic Medalists. Since coming to the U.S. in 2002, and for more than a decade now, Buruian has also trained those who "protect and serve" in the art of self-defense. He has taught members of the US military as well as law enforcement officers in personal protection should they ever need to use it -- combining traditional martial arts with street fighting tactics mostly associated with Krav Maga. Buruian knows firsthand what it's like to serve in uniform; he spent three years as an elite Romanian Special Forces operative. He also fought in professional mixed martial arts (MMA) competitions in the mid-90s. And his lifetime record isn't too shabby -- an impressive 37-3 record in tournaments fought throughout Eastern Europe. Today Buruian devotes his time to teaching his expert techniques to students of all ages. Since 2009, he's been an instructor at the White Tiger Martial Arts center at 286 W. Palatine Rd. in Wheeling. Recently, he also began overseeing the Krav Maga curriculum at the newly opened White Tiger Martial Arts in Chicago's Lincoln Park neighborhood. "It's so rewarding seeing young kids and adults enjoy learning martial arts the way that I did," Buruian added. "They thrive in learning something new and you can see their confidence build. I hope to introduce some of them as Hall-of-Fame Masters in the future."